(CNN) -- When Shaun Yandell proposed to his longtime girlfriend Gina Marasco on the doorstep of their new home in the sunny suburb of Elk Grove, California, four years ago, he never imagined things would get this bad. But they did, and it happened almost overnight. "It is going to be heartbreak," Yandell told CNN. "But we are hanging on." Yandell's marriage isn't falling apart: his neighborhood is. In Elk Grove, some homeowners not only cut their own grass but also trim the yards of vacant homes on their streets, hoping to deter gangs and criminals from moving in. Other residents discovered that with some of the empty houses, it wasn't what was growing outside that was the problem. Susan McDonald, president of a local neighborhood association aimed at saving the lost suburban paradise, told CNN that around her cul-de-sac, federal agents recently busted several pot homes with vast crops of marijuana growing from floor to ceiling. And only a couple of weeks ago, Yandell said he overheard a group of teenagers gathered on the street outside his back patio, talking about a robbery they had just committed. When they lit a street sign on fire, Yandell called the cops. "This is not like a rare thing anymore," he said. "I get big congregations of people cussing -- stuff I can't even fathom doing when I was a kid." For Yandell, his wife and many other residents trying to stick it out, the white picket fence of an American dream has faded into a seemingly hopeless suburban nightmare. "The forecast is gloomy," he told CNN. "The American dream is absolutely changing," he told CNN. This change can be witnessed in places like Atlanta, Georgia, Detroit, Michigan, and Dallas, Texas, said Leinberger, where once rundown downtowns are being revitalized by well-educated, young professionals who have no desire to live in a detached single family home typical of a suburbia where life is often centered around long commutes and cars. The so-called New Urbanism movement emerged in the mid-90s and has been steadily gaining momentum, especially with rising energy costs, environmental concerns and health problems associated with what Leinberger calls "drivable suburbanism" -- a low-density built environment plan that emerged around the end of the World War II and has been the dominant design in the U.S. ever since. Thirty-five percent of the nation's wealth, according to Leinberger, has been invested in constructing this drivable suburban landscape. But now, Leinberger told CNN, it appears the pendulum is beginning to swing back in favor of the type of walkable community that existed long before the advent of the once fashionable suburbs in the 1940s. He says it is being driven by generations molded by television shows like "Seinfeld" and "Friends," where city life is shown as being cool again -- a thing to flock to, rather than flee. "The image of the city was once something to be left behind," said Leinberger. Changing demographics are also fueling new demands as the number of households with children continues to decline. By the end of the next decade, the number of single-person households in the United States will almost equal those with kids, Leinberger said. Recent market research indicates that up to 40 percent of households surveyed in selected metropolitan areas want to live in walkable urban areas, said Leinberger. The desire is also substantiated by real estate prices for urban residential space, which are 40 to 200 percent higher than in traditional suburban neighborhoods -- this price variation can be found both in cities and small communities equipped with walkable infrastructure, he said. The result is an oversupply of depreciating suburban housing and a pent-up demand for walkable urban space, which is unlikely to be met for a number of years. That's mainly, according to Leinberger, because the built environment changes very slowly; and also because governmental policies and zoning laws are largely prohibitive to the construction of complicated high-density developments. But as the market catches up to the demand for more mixed use communities, the United States could see a notable structural transformation in the way its population lives -- Arthur C. Nelson, director of Virginia Tech's Metropolitan Institute, estimates, for example, that half of the real-estate development built by 2025 will not have existed in 2000. "What is going to happen is lower and lower-middle income families squeezed out of downtown and glamorous suburban locations are going to be pushed economically into these McMansions at the suburban fringe," said Nelson. "There will probably be 10 people living in one house." In Shaun Yandell's neighborhood, this has already started to happen. Houses once filled with single families are now rented out by low-income tenants. Yandell speculates that they're coming from nearby Sacramento, where the downtown is undergoing substantial gentrification, or perhaps from some other area where prices have gotten too high. He isn't really sure. But one thing Yandell is sure about is that he isn't going to leave his sunny suburban neighborhood unless he has to, and if that happens, he says he would only want to move to another one just like it. "It's the American dream, you know," he said. "The American dream." Are the suburbs where you live changing? Would you trade your suburban home for a place in a more walkable community? 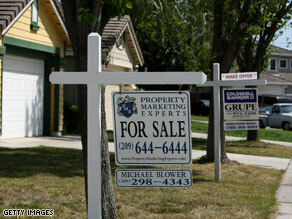 Do you think the suburbs in America will really become a trend of the past? Leave your comments in the "Sound Off" box below.